I didn’t mean to disappear for so long, but I’ve been up in the attic. Not for the duration of course, but for a good few hours. Since I moved home to look after my mother a good few of my books – mainly the ones I’ve read – live up there for lack of space downstairs. I went up to pull of my Du Maurier collection, for Discovering Daphne, but I got pulled in other directions. It was time to have a good sort out, and to bring my records on LibraryThing bang up to date. I got rather dusty, but it was wonderful to get a bit more organised and to meet some lovely books I hadn’t seen for a while. Growing up in Cornwall, when Daphne Du Maurier was still alive and living a few miles up the road, meant that I discovered her books very young. I fell in love and have read most of them more than once over the years. After reading a couple of modern takes on Rebecca it’s time to re-read the original, and remind myself why it’s so special. The sequels have just been reissued, but I think I should reacquaint myself with Cold Comfort Farm before I order them from the library. The BBC adaptation of the first three Jackson Brodie books reminded me just how good they are, and made me want to go back to the beginning and start all over again. Lifetime Reader wrote about this a while back, and reminded me how much I love Hardy. Actually, I want to re-read all his books, but this feels like the place to start. 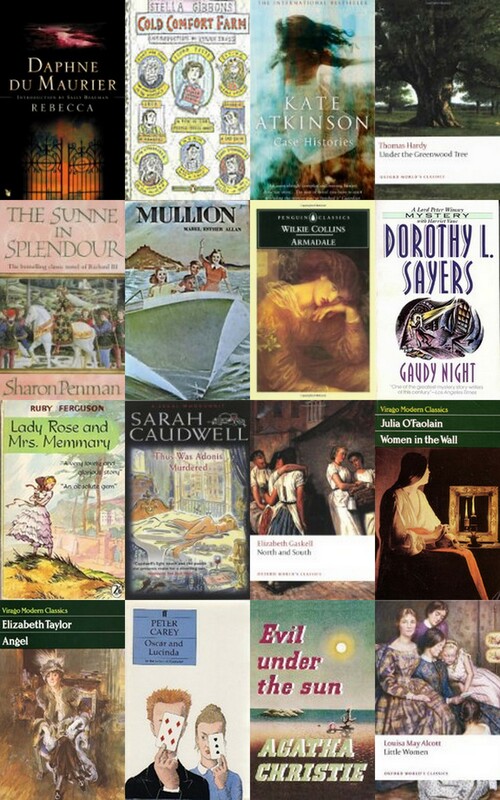 The first historical novel I read, and finding it again was a joy. Lydia Gwilt! Another author I love, and I want to re-read everything Wilkie Collins ever wrote. I picked up a book by J I M Stewart, whose praise Karyn has been singing, and it mentioned a gaudy dinner. That made me want to pull out Gaudy Night, though I had been planning to re-read DLS in chronological order. What to do?! I read this one on holiday last year, when I was on a blogging break. I loved it, and I would like to write about it, but I need to re-read first. I only read North and South earlier this year, but I could so easily go back to the beginning and start reading all over again. I read this years ago, and I was stunned. I’ve never read anything else by Julia O’Faolain, because I thought nothing could live up to the expectations set by this book. I saw the film a while back, and I remembered just how much I love the book. I don’t know what it is about this book, but I know that I love it. My mother was watching this when Briar and I came in from a walk a little while ago. I remembered how clever the plot was and thought that I really should read it again. I inherited my mother’s copy as a child and I have read it so many times, but it’s been a while and it’s time to meet the March girls all over again. But, tell me, what are your feelings about re-reading? Are any books calling you back? Sarah Caudwell is good! There’s the professor, Hilary something, and we don’t know whether he’s a he or a she, and his/her students? (I read them a long time ago… And I’m reading (and loving) Kate Atkinson again, too! I read the first two books about three years ago, and thought I’d try to get at least one more in before the series airs here in a couple of weeks. What a fantastic list of books! I am a devoted rereader, though probably less so since I started blogging and started adding books to my TBR list at an alarming rate, and everytime I look at my bookshelves I’m overwhelmed by the number of titles I want to revisit. It’s been ages since I read anything by Sharon Penman though and I think that might have to be remedied soon now that you’ve reminded me about her. I’ve read 6 (counting on on audio) on your list, and 4 of those many, many times. I used to reread constantly. Now, like Claire, I’m overwhelmed by my TBR and don’t reread much. 😦 I’d like to think this won’t always be true, but I’m not quite sure how I’m going to make it happen. Every winter when the wind is howling and the snow if flying, I haul out Pride and Prejudice, Northanger Abbey, Sense and Sensibility for a reread. Then I am whisked away to Jane Austen’s England, the antithesis of a Canadian winter. Not as frequently but every bit as loved are the Master and Margarita by Bulgakov, Lord of the Rings by Tolkien. But best of all is the Mapp & Lucia series by E.F. Benson. These books have pulled me through some pretty grim times in my life. As always re reading the classics. I doubt I will ever get tired of Pride and Prejudice. Read it when I was about 13 years of age – can’t even remember how many times I’ve read it again and again. Mayor of Casterbridge again a school text, even Chaucer has been read and re-read. How lovely to rediscover all those books! I’m not usually one for re-reading either (too many books, too little time) but I do have some that I would like to try again to (like you) see if I feel the same way. I’ve never come across Women in the wall – with your recommendation I shall purchase a copy from Amazon! Currently re-readingThe Heaven Tree trilogy by Edith Pargetter. I used to reread my favourite books constantly until blogging made me more aware of all the books I still haven’t read. I don’t think I’ve reread a single book this year, which makes me feel sad. I’m determined to set aside some time for rereads next year! Having just reread Persuasion, completely fallen in love with it and realised how much I missed on my first read there are now lots of books I’d like to reread. That’s another reason why I like blog readalongs – it inspires a reread. Enjoy your rereading. What to do about DLS, you ask. My advice is to read Gaudy Night first, since that’s the one calling you, then go back to the others as you like. After all, if you’ve read them all, there are no spoilers. I have been rereading books from my childhood this year. Like you and many others, why reread something when there is so much new out there to enjoy. But there is a great comfort I think in rereading and it has its place, as I think as time passes we perhaps get different things out of books we may not have had in the past. Your post has reminded me of never having read Cold Comfort Farm, but only seeing it on TV. I’m in the process of re-reading the Harry Potter books and actually loving them more the second time around. The books you have chosen look great and i honestly look forward to reading your thoughts on them. I’m sure to add a few to my TBR list! I always plan to re-read more than I actually do – I like the idea of it hugely, but the TBR and all the new shiny books call and I rarely get around to it. This year I re-read Lord of the Flies and Brave New World for a dystopian season and got so much more out of them, so it is definitely a thing worth doing for me – but I wouldn’t re-read just anything! There are quite a few of my favourites there, I’ve been wanting to re-read Gaudy Night for ages but I can’t find it ! It’s nice to know that someone else is reading J.I.M. Stewart.